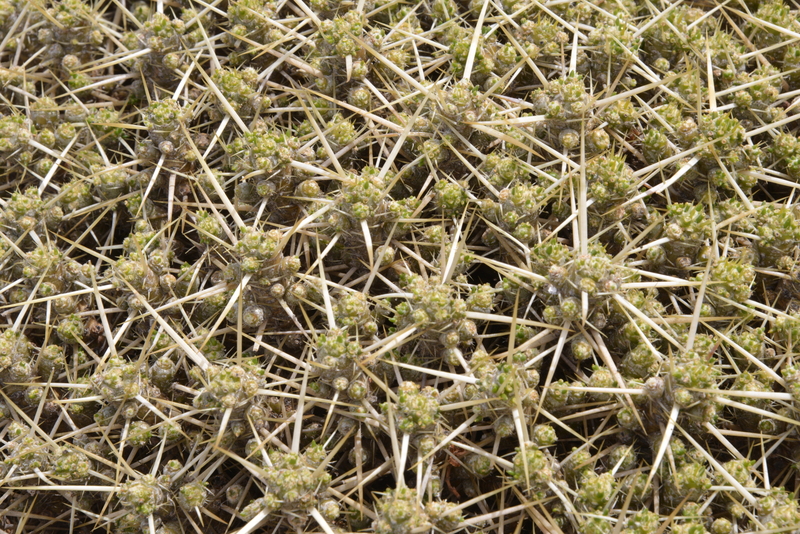 You may remember that I left you yesterday facing the task of appeasing Angie after a ‘no(t enough) cacti’ day. But a larger challenge awaited us. Just round the corner of the Hotel was Restaurant Petite that on Friday night had served up an excellent meal (fillet steak & mushrooms for me). And that, after I had read on the Lonely Planet website:’For a good meal in pleasant surrounds Chos Malal doesn’t have a whole lot of options’, so we were pleasantly surprised by our discovery and I had every intention, after another great meal tonight, to give the tiny restaurant a great write up on Lonely Planet. We had checked to see if she’d be open on Saturday night and she replied in fluent Spanish: ‘yes of course, starting sometime between 20:30 and 21:00’. Excellent, sorted! So last night we rolled up at 20:50, but everything was shut, no lights on. Ah, well, we must be early. Let’s take a stroll around the block. So, where do two hungry tourists, not familiar with the local language, get a meal late in the evening. As some of you may know, I’m diabetic and do need my food at regular times – no food was not an option! Would the muesli bars that we had in the room be enough? Back in the room we consulted the internet again. There was just one Restaurant listed, but as we walked into town, we found many of the ‘streets’ being in the progress of refurbishment, with street furniture such as street names missing. We had reached the Plaza without having found the necessary road to the right. There was another long queue at the fuel station – favourite pastime is queueing for fuel, even when there seems to be no apparent reason for it? The Fuel Station had a snack bar that advertised empanadas. That was better than nothing – except: they had just run out. The girl serving was highly embarrassed and with as much English knowledge as we spoke Spanish, signalled us to follow her. We struggled to keep up as she took us a few houses up the road where, next to what we had assumed to be a clothes shop – shut – there was a door to a room where a man was folding cardboard boxes. She explained our need for empanadas. A head poked round the corner and with the help of the girl’s best English, we ordered a cheese and a meat one each – a real Saturday night feast! With a muesli bar as afters and a can of Quilmes beer, our feast was complete. I hope the owner of Restaurant Petite had a rotten evening! After a good night’s rest and breakfast we were off. 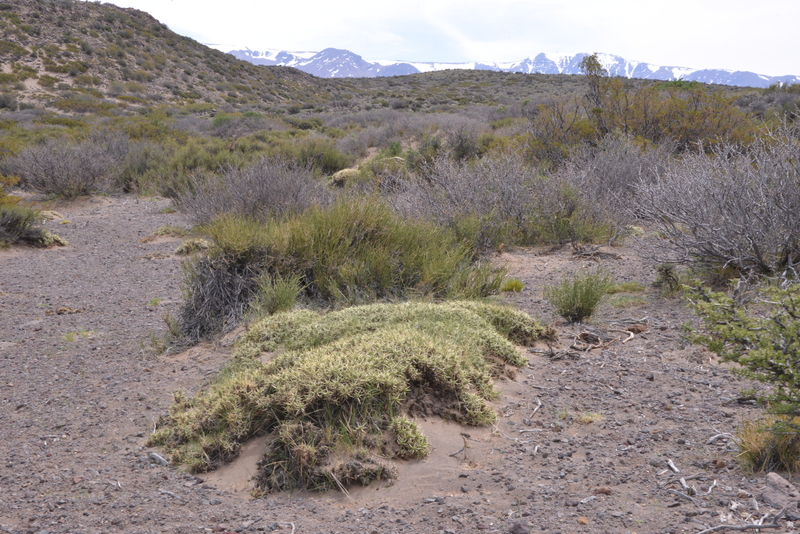 Angie was familiar with the 2010 group photo of the four of us posing behind a huge mound of Maihuenia and I had established that this would be on the 145, off RN-40 quite close to Malargüe – just some 70 km each way. So let’s go and take a look. I had also loaded some locations of the day in 2010 into SatNav, but without Argentine mapping, it could just tell us how many km. away it was, in a straight line – 110 km. 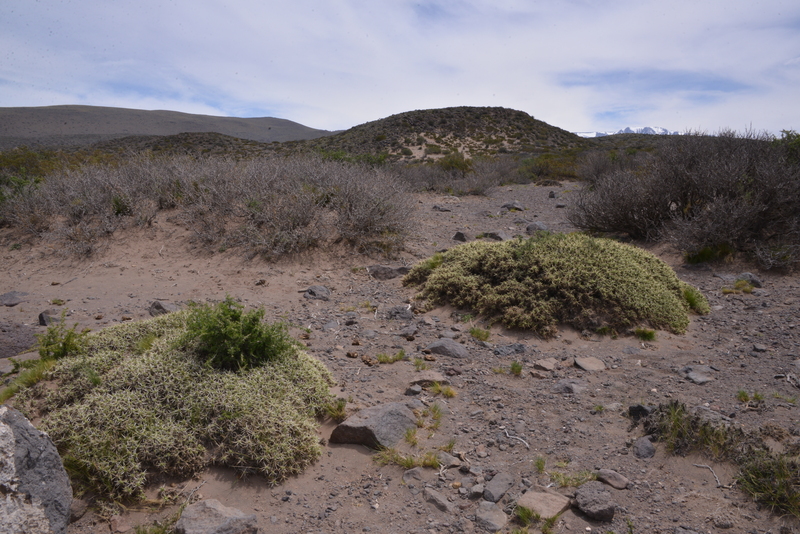 We also had location data for a new discovery of Denmoza rhodacantha found for the first time (?) outside the Province of Mendoza. 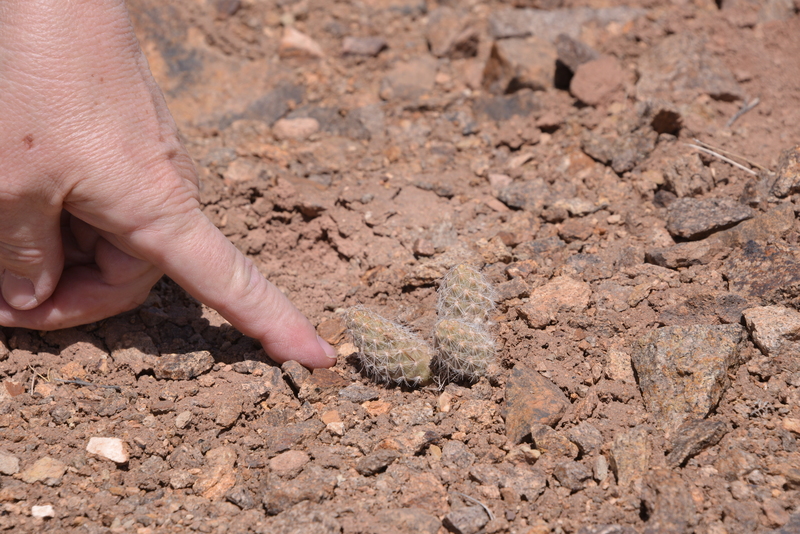 So I was quite confident that Angie’s hunger for cactus images could be satisfied. Again, it was a wonderful sunny day. The lined trousers and jumpers packed for this trip were just spare luggage – bet it would have been freezing if I had left them at home! After just over an hour I needed to stretch my legs (S2874). There was a low hill alongside the road and it reminded me strongly of a 2010 location (S2097), the one that we were looking for, 110 km away! 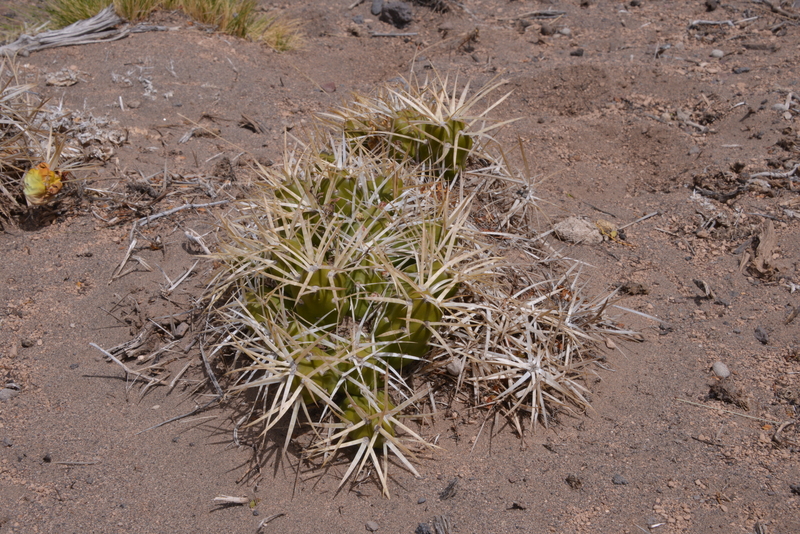 Soon I stumbled across small clumps of what we had called Maihueniopsis darwinii in 2010 but that taxon is limited to Santa Cruz Province, so this time I’ll use the suggestion from others that it is Maihueniopsis glomerata ssp hypogaea . 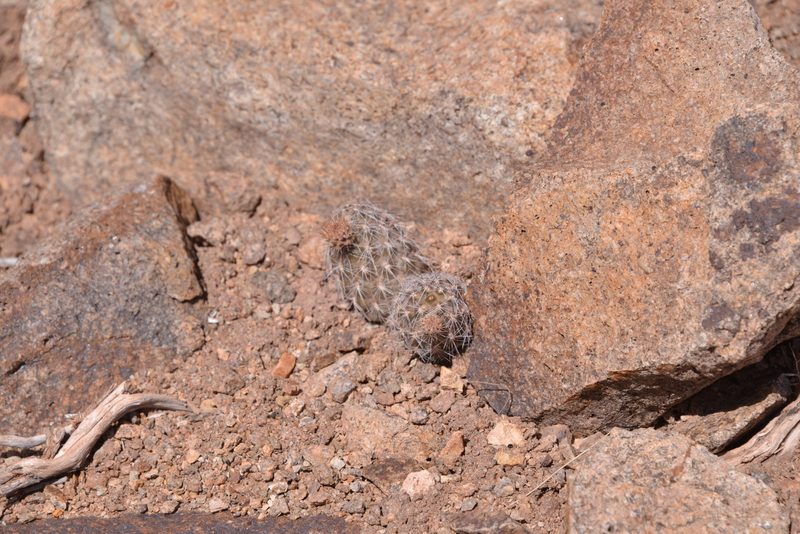 I called Angie over and we happily snapped away as more clumps were found. 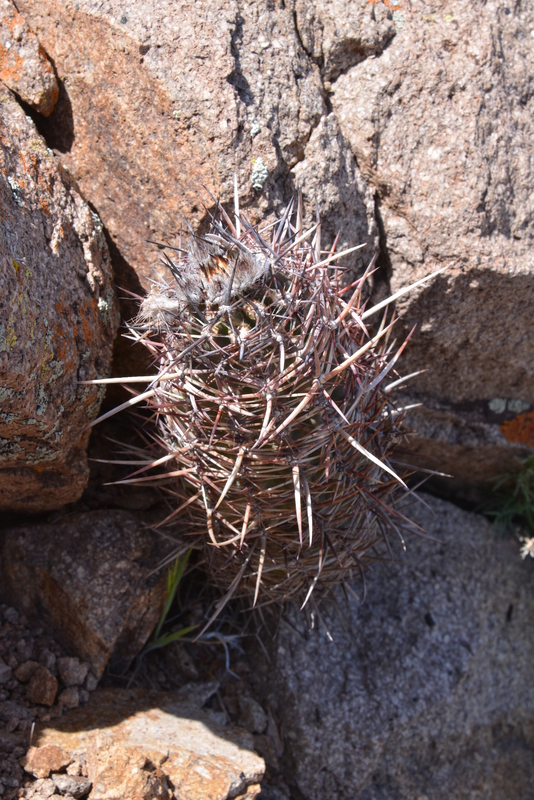 Next success: a kicked out stem of Austrocactus! OK, it had been dead for quite a while, resembling plants in my collection back home in the UK – but where there is a dead plant, there may be live ones? But first, I stumbled over a small clump of Mauhuenia patagonica, then another and another, each larger than the previous one. Great! Two out of the three species that I might have hoped for, plus a dead example of the third! So the search was on for the Austrocactus, it just had to be here. 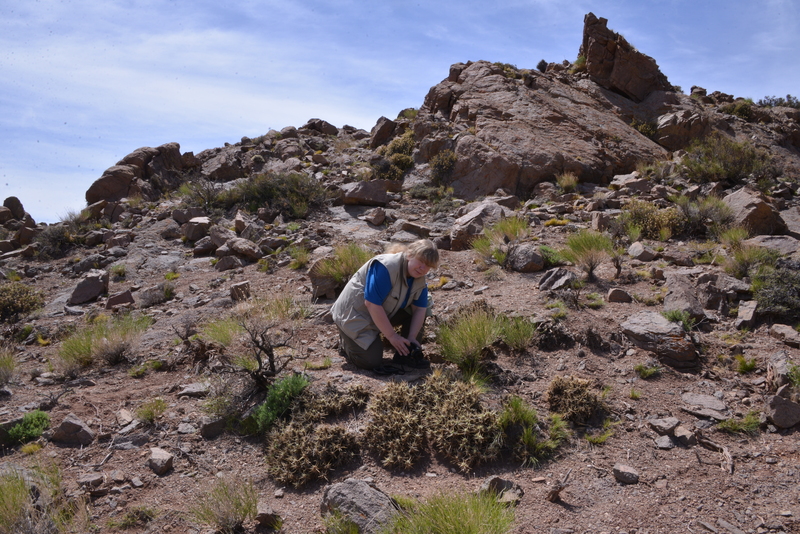 Eventually the search was rewarded with a plant, some 15 cm (6”) tall. 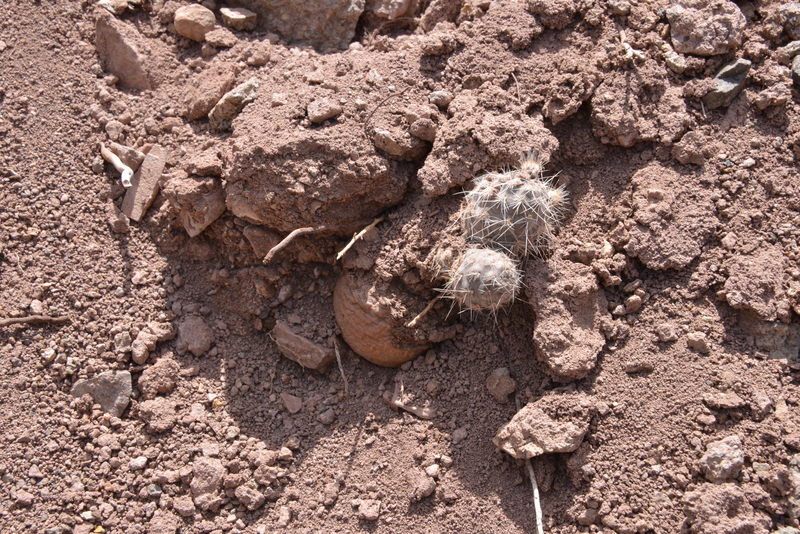 Not only was it alive but it had 4 small buds and signs of new growth at the apex. One thing was sure – they were not abundant! 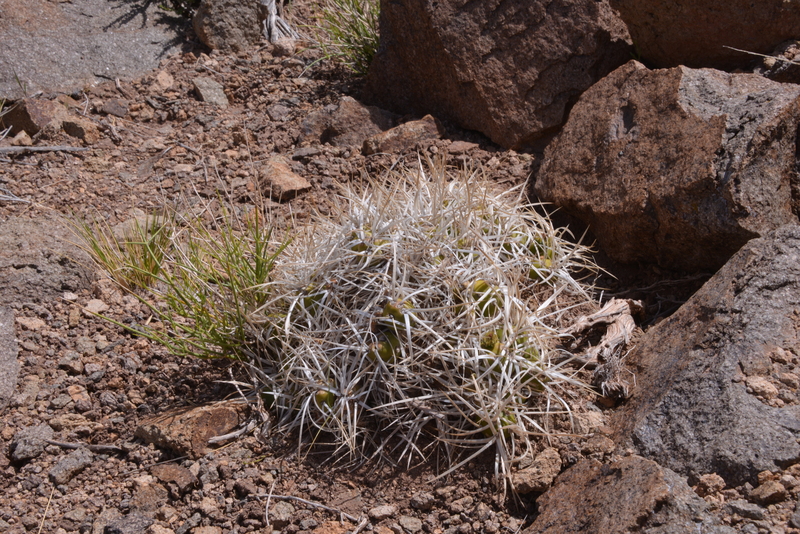 We managed to find two or three more plants and were about to return to the car, happy with our booty of cactus images when I stumbled across Pterocactus – probably P. fischeri, if that is an accepted name these days. Quite a few of them and some in bud. 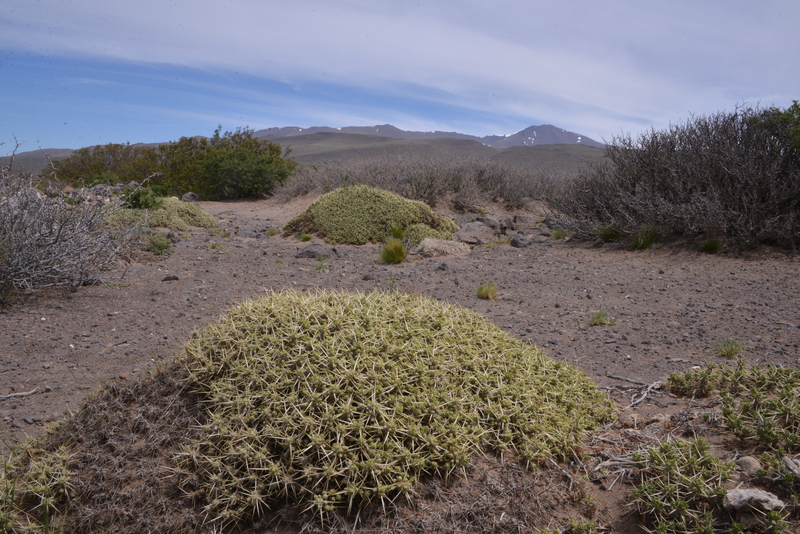 A really great stop for Patagonia after the long period lacking cacti. We were still excitedly talking about our finds when we crossed a river. Was this the Rio Colorado that formed the northern border of Patagonia? The sign at the bridge said Rio Barrancas. According to our tourist map, we had already passed Buta Ranquil, where without noticing it, we must have crossed the Rio Colorado. Just as well, as soon after entering Mendoza, RN40 turned into a ripio, with a maximum speed of 40 km.p.hr. recommended for our Kojak tyres. The signs of roadworks in progress seemed fairly permanent. Were these still the same road works as in 2010? The signs warned that these roadworks would be with us for 40 km. That’s one hour at 40 km.p.hr., longer, allowing for photo stops. After a short spell of new asphalt it was back to ripio and so on and on. We passed a village with a couple of fuel pumps. Great! But they had diesel only, not recommended for a petrol engine! Nafta would be available in 50 km. Well, that turned out to be 67 km and then we got stuck at the pumps where the driver in front of us left his car blocking the pumps, presumably for a call of nature, returning some 10 minutes later with a couple of milkshakes from the nearby restaurant! Anyway, we arrived safely in Malargüe. Brand new asphalt started some 20 km before we entered town and the whole town seemed to have benefitted from a facelift since 2010. We headed for the Microtel at the north end of town. The alterations in progress in 2010 were still in the same state, but boarded off in a more formal (semi permanent?) way. Rooms were as comfortable as I remembered them and the bar area, where we enjoyed a bottle of the late Graham Hole’s excellent single malt whiskey (Auchentoshan), still echoed to the voices of Guillermo Rivera’s Patagonia touring party and my fellow travellers. Great memories. Cheers, Graham!